Has a majority owner, Sun Capital Partners (51%), which should ensure a board acting in the interest of shareholders. Founded in 1915, Gordmans Stores (NASDAQ: GMAN) is an Omaha-based apparel and home fashions retailer. It operates 83 stores in the US. Gordmans features name brand apparel, accessories, footwear, home decor, gifts, designer fragrances, furniture, and more at everyday savings of up to 60 percent off department and specialty store prices. While the company operates within the value segment of the industry, Gordmans differentiates itself by offering department and specialty store name brands, fashions and styles in a more upscale shopping environment. Over the last four years, Gordmans has enjoyed significant growth, expanding its number of stores by nearly 50 percent. They plan to increase the number of stores by around 10% annually. For UK investors, think of TK Maxx, and you get the idea about the type of business Gordmans is, quality brand labels at constantly discounted prices. They buy end of season products in bulk at low prices but are not reliant on any one source (largest is 2% of purchases). Many of their competitors sell items for a higher price but then use special offers. Gordmans offer a single price year round so while the final selling prices may be similar, Gordmans offers customers greater certainty. Their advantage is evident by their success over the last 100 years. For example, as of February 2013, approximately 49% of stores operated within one mile of a Kohl’s, 52% operated within one mile of a J.C. Penney and 61% operated within one mile of a Wal-Mart. A Wal-Mart operates within five miles of 100% of their stores yet they are highly profitable. In September 2008 Sun Capital purchased 100% of Gordmans Stores in effect. At the time it had net income of $4.4m and profit margins of 1%. It was IPO’d in August 2010 for $11 a share. They retained 70% of the common stock at the time. In May 2012 they sold a further block of shares for $16.75. The current share price is $11.25. Below is the 5 year history as displayed in their latest 10-K. You can see that the Sun Capital deal has improved the operating performance of the company. Its net profit margin peaked at 4.5% in 2012. Fiscal 2010 includes IPO costs, which once excluded increase Net Income to $22.3m. The most important thing to understand with this company is that it has a lot of off balance sheet liabilities. That is how it manages to get an impressive return on assets. Rather than buying its stores, it develops them and then does a sale and leaseback. This is a common retail strategy but it hides contractual lease liabilities off the balance sheet. 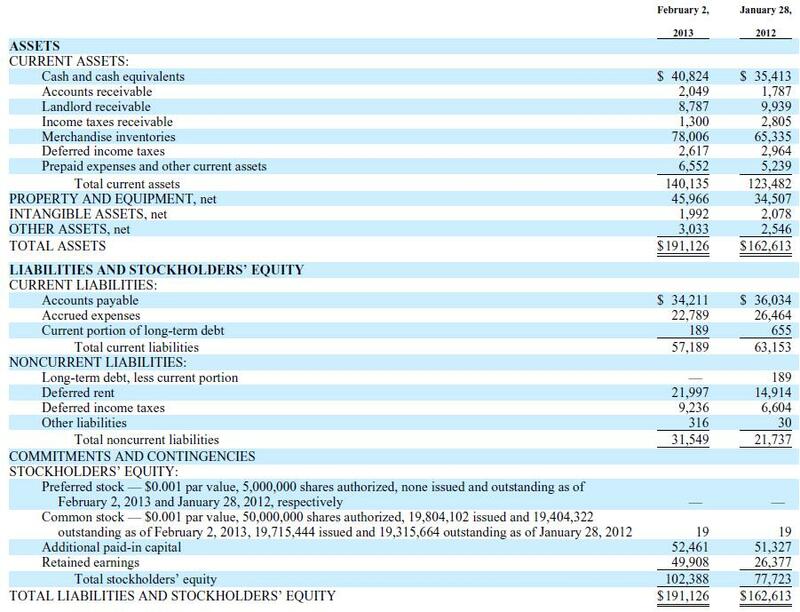 As a result the balance sheet is made up of mainly inventory and other working capital as shown below. (deferred rent is an accounting tool, nothing sinister). Its contractual lease obligations are $45.6m per year. This is greater than their 2013 EBITDA of $38m. Now leases are preferable to debt, as under-performing stores can be shut down and a new tenant found thereby ceasing the companies obligations. However until a tenant is found the company remains liable for the rent and this is a risk when leases are only thinly covered by earnings. Fortunately the company has undrawn $60m revolving credit facility in the case of emergency which should give it headroom in a time of crisis. Why is it near 52 week lows? In March the company issued revised earnings guidance (downwards) after same store sales declined 4% in the quarter. I do not believe this is a long term trend in the business but it is something that needs management attention. Here are some quotes from the releases on the issue. “Net income for the fourth quarter of fiscal 2012 was $7.9 million compared to net income of $10.2 million in 2011. Comparable store sales for the fifty-two week period ended January 26, 2013 decreased by 0.7%. Looking ahead to the first quarter, we are forecasting comparable store sales to be down low double digits and margins to be under pressure as we focus on rebuilding our assortments in the areas where we were deficient last year. The shortfall in gross profit margin to last year is anticipated to moderate in the second quarter vis-à-vis the first quarter and is projected to be flat just slightly higher than last year for the second half. Q: So, really, the change in the trajectory that you’ve seen, you think, is largely due to some merchandising missteps on your part more than the economy? A: Well, I guess, the combination of some merchandising missteps, then I think we’ve taken a tremendous number of corrective actions, including changes in leadership and refocus on selection, which is the #1 loyalty driver articulated by our guests. So as well as, certainly, there are issues related around how we flowed merchandise. And we probably concentrated our received flow too heavily in the months of October and November, which resulted in problems from the system dynamic perspective that manifested themselves — distribution center, as well as in stores. Inventory build up – inventory days has increased from 39 in 2010 to 46 in 2013. Companies that are growing are difficult to value, as free cash flow is used for expansion and is impossible to untangle from same store business operations. 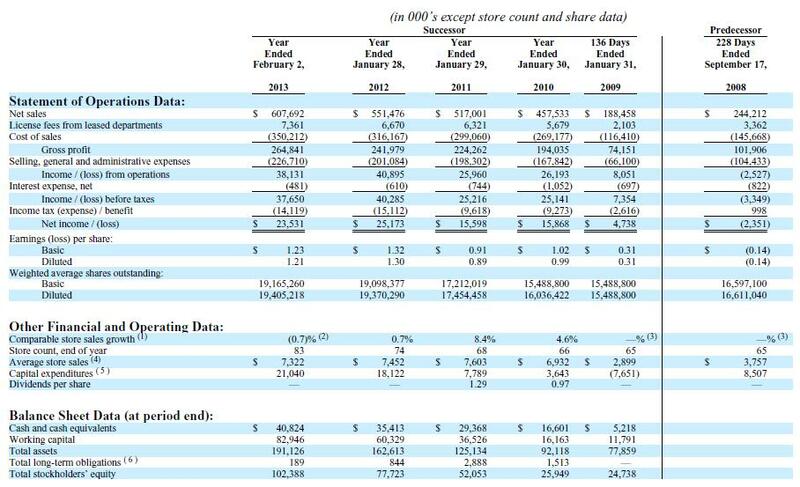 Luckily their latest earnings call at least confirmed capital expenses related to recurring business was 2% of sales ($12.1m). This compares to a depreciation charge of $7m. This is a big difference of $5m and reduces 2013 ‘owner’ earnings to $18.5m, or $0.95 per share (3% net profit margin). But I don’t think cash flow is the best measure for valuing this business at this stage. Instead I will capitalise future ‘owners’ earnings as I believe this gives a more realistic valuation for growth companies. They have a clear growth strategy, new store increases of at least 10% per year. If we extend this for 5 years, discounted a little for next year and sales difficulties we get sales of around $985m. At a 3% margin that yields net profits of $30m. Capitalised at 10% and discounted back 5 years to the present day that gives a valuation of $186m. Today’s market cap is $219m. I think it is currently fairly valued, but with these kinds of businesses the market frequently overvalues them because it focuses on earnings rather than cash flows. Also the high growth of the company mitigates some of the downside risk as growth compensates for any weakness in the business. As such I think this stock should do well and is a good business at a fair price. Excellent analysis. One comment that I warn you of. You mention that Sun Capital Partners owns 51% of shares and conclude that this should ensure that this should keep the board acting in the interest of shareholders. Sun Capital Partners’ best interests might not be the same as the other shareholders. Considering that Sun Capital Partners has a history with the company, it would be just as possible that SCP could force the board to make investment decisions that might not benefit the investor until the very long run (> 5 years). A common example of this is continuing to fund losses of unprofitable stores in hopes that they would become profitable in the future. Just a concept to consider. Again, your analysis is excellent.